On January 3, 2017, and for only the third time since 1973, a new president took over the reins at RBB. In honor of this historic event and Jim Tennant’s much-deserved promotion, I’d like to share a quick story that demonstrates how Jim began strengthening this organization on day one. I hired Jim as general manager of RBB three years ago. Previously, he worked at Prentke Romich Company, where he served as VP of manufacturing and operational systems. That Monday morning, in his first hour on the new job, Jim was handed a resignation from one of his key department leaders. Neither of us had seen this coming. Over the next couple of days I watched Jim handle the situation with grace, treat the person leaving with respect, open up the dialog within that department, rally the troops and forge an even stronger direction for RBB and our clients. I was impressed. I knew that a calm head in a storm would serve him (and RBB) well. After all, our business is assembling and testing custom electronics – all in small batches – and strong, unruffled leadership is key. So as not to embarrass Jim, I’ll try to tread lightly with the compliments here. 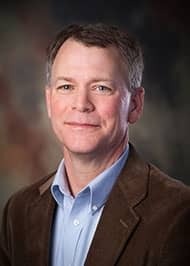 Jim is a great fit for the role of RBB president because he’s that rare leader who combines great technical knowledge, a proven ability to get strong business results and the desire for establishing a personal, values-centered relationship with everyone he encounters. Jim has also been a client of RBB’s, so he knows what it’s like to be on both sides of the transaction. As he learned our business more intimately, he dove in with vigor to make an impact in every corner of the organization. As a result, team membership, expectations and performance have improved, our unique RBB mojo remains strong and we’ve invested heavily in new equipment technology, enabling higher quality and faster small batch changeovers. As a former small-business owner himself, Jim knows first-hand how critical it is that every link in the chain functions well in order to satisfy clients, employees and other stakeholders in the business. In my 16 years with RBB, never have we been this strong. And when a leader delivers these kinds of results so quickly, the wise business owner rewards him or her with more work and responsibility! Jim will be charting our course for growth and expansion, and for capturing the full potential of our small batch market niche. I now carry the title of CEO and owner, and retain the subtitles of marketing manager and director of mojo. And to provide a little practical reassurance, RBB clients will see zero negative impacts resulting from this leadership transition. Jim and I will continue to work in close collaboration on all client matters and look forward to doing so for many years. The future of RBB has never been brighter. Embarrassed yet, Jim?